"I fell in love with Carlos O'Kelly's chili con queso with chicken, and experimented until I came up with something I think is a great imitation. It's often a requested appetizer dip at family functions. Serve hot with tortilla chips." Heat butter in a skillet over medium heat, and cook and stir the tomato, onion, and garlic until the tomato has released its juice and the juice has become thick and syrupy, about 10 minutes. Mix in the processed cheese cubes, and stir until melted and smooth. Stir in the sour cream, shredded chicken, green chiles, salsa, seasoned salt, and oregano until thoroughly mixed, and cook until hot but not simmering, about 5 minutes, stirring constantly. Serve hot. 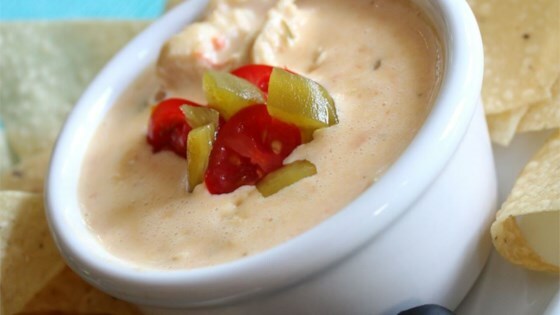 See Chef John’s secrets for making the best game-day dip ever! This was ok. Too much garlic in my opinion (my guests agreed). Was creamy and had some good chunks of tomato/chili which I like. Good queso, but it may as well have been the basic Rotel variety. Processed cheese is processed cheese, no matter how you dip it. I totally agree about the onion. My original submission had close to 1/2 cup of onion, but somehow it got lost between there and posting. This was excellent. I left out the chicken as I didn't have any but it was still very, very good. This was an excellent dip. The only thing that I did differently was add more onions and additional salsa to give it a little zing.